Academic version has all the same functions as retail version without any restrictions what so ever. Payment options, Credit Card (Visa/MasterCard), Bank Deposit, PayPal, Cheque, Money Order & Cash on Pickup (When Available). Note: Bank Deposit, Cheque, Money Order not available to International customers. International customers, please advise your customs/tariff requirements for your country. Further buying, shipping, warranty and general information can be found below, and if you have any questions then please contact us. Thanks for looking and happy ebaying! 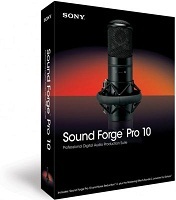 Sony Sound Forge Pro 10 - Sound Forgge Pro 10 software efficiently and reliably provides audio editors and producers complete control over all aspects of audio editing and mastering. Whether in the studio or field, it's the ultimate all-in-one production suite for professional audio recording and mastering, sound design, audio restoration, and Red Book CD creation. New features in Sound Forge Pro 10 include precise event-based editing, integrated disc-at-once CD burning, musical instrument file processing, and pristine audio conversion and time stretching. Sound Forge Pro 10 software includes a full suite of tools for professional digital audio editing and production, CD burning, plus Noise Reduction(TM) tools for audio restoration. New features in Sound Forge Pro 10 include event-based editing, disc-at-once CD burning, Zplane elastique Pro timestretch and pitch shift plug-in, plus the Mastering Effects Bundle 2 powered by iZotope(TM), a collection of six professional audio plug-ins. Additional new features in Sound Forge Pro 10 software are included in the list below. 1. Pristine sound quality - Sound Forge Pro 10 software supports full resolution 24-bit and 32-bit/64-bit float 192 kHz files for the ultimate in audio fidelity. Capture the subtle overtones and nuances of instruments, vocals, and effect changes. Additionally, Sound Forge Pro 10 software includes industry-leading iZotope MBIT+(TM) Dither (bit-depth conversion) and 64-Bit SRC(TM) (sample rate conversion) for the highest in audio quality. 2. Precise audio editing - Edit mono, stereo, and multichannel audio files (up to 32 channels) down to the sample level. Use familiar Windows commands to cut, copy, paste, mix, and crossfade audio. Perform precise event editing and create fades, crossfades, and mix audio with ease. Drag and drop audio between channels and work on one file while processing others in the background. 3. Powerful audio recording - Sound Forge Pro 10 software has a complete set of tools for recording audio. Record straight into your sound card or use the Record Timer to begin and end a session at a specific time and date. Alternatively, you can start recording when a certain audio threshold is reached with Threshold Record Triggering. You can also record and edit multichannel audio files as easily as stereo files. 4. Includes tools for sound design and mastering - In addition to Sound Forge Pro 10 software, this comprehensive audio production suite includes the Noise Reduction 2 plug-ins to fix common audio problems such as tape hiss, camera hum, clicks, and pops, powerful Spectrum Analysis tools for analyzing audio, and the Mastering Effects Bundle 2 powered by iZotope(TM), a collection of six professional audio plug-ins. Sound Forge Pro 10 software also includes integrated disc-at-once (DAO) CD mastering for producing Red Book audio CDs. 5. Effects processing - Apply over 40 professional studio effects and processes including Normalize, EQ, Delay, Chorus, Volume, Dynamics, Noise Gate, Pitch Shift, Flange, and Vibrato. Sound Forge Pro 10 software includes high-quality Zplane elastique Pro timestretch and pitch shift plug-in for pristine audio mastering, and the Mastering Effects Bundle 2, powered by iZotope. This powerful bundle includes six professional audio plug-ins: Mastering EQ, Mastering Reverb, Multiband Compressor, Mastering Limiter, Stereo Imager, and Harmonic Exciter. 6. 24-bit, 32-bit/64-bit float/192 kHz support - Sound Forge Pro 10 software supports full resolution 24-bit/32-bit 192 kHz files for the ultimate in audio fidelity. Capture the subtle overtones and nuances of instruments, vocals, and effect changes that 24-bit audio provides. With Sound Forge audio software you can import, save, and even record to this resolution if using supported hardware. 7. Audio-for-video - Sound Forge Pro 10 software supports multiple video formats including AVI, WMV, and MPEG-1 and MPEG-2. Precisely synchronize audio and video frame by frame. Sound Forge Pro 10 software includes MPEG-2 templates for writing HDV-compliant files at both 720p and 1080i resolutions, and AVI templates using the CineForm CFHD codec for 720p and 1080i intermediate renders. Also included are templates for encoding WMV 720p and 1080p. Цена по нашему прайс-листу - 326 руб. Есть вопросы по SONY SOUND FORGE 10 PRO AUDIO PRODUCTION SUITE NEW?